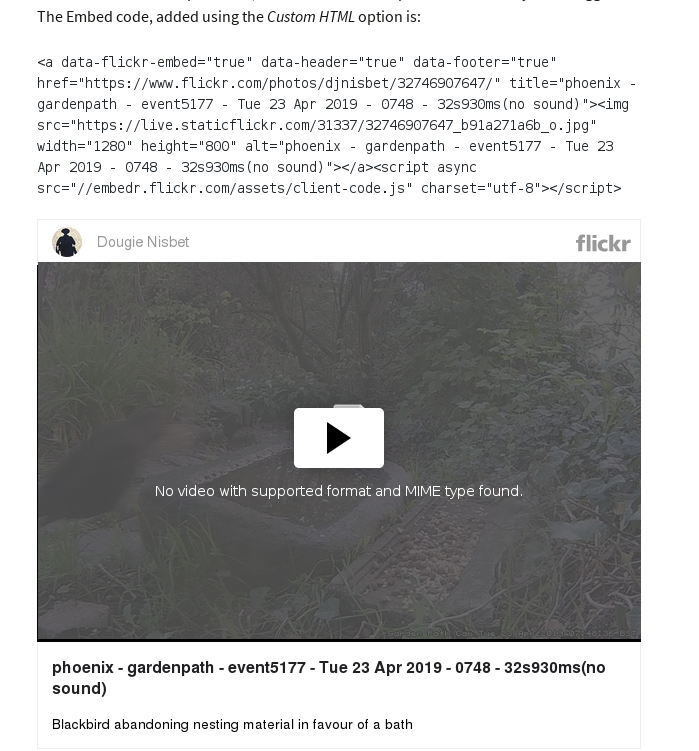 I can’t keep up with video embedding in WordPress. It changes, it breaks, I try and keep things simple. A few tests to embed video from flickr and zenfolio. These are mp4 files created by motion for a Vivotek IP webcam. This seems to work ok on desktop, Firefox. But no ability to play full-screen or link through to original on zenfolio. Also not so sure about the responsiveness on a smartphone. In fact looks a bit broken overall on iPhone. This is using the Share option available to the owner when logged into Zenfolio. There’s a range of sizes/qualities linking to the original mp4. Quality differences not that relevant for a webcam but I’ve used the best one anyway. In the following example I’ve used the Video option under Common Blocks and selected Insert from URL. This seems to work as good as the embedded code but with perhaps a bit more buffering. You can click through to full-size, but not to the original zenfolio page. And still pretty broken on an iPhone. 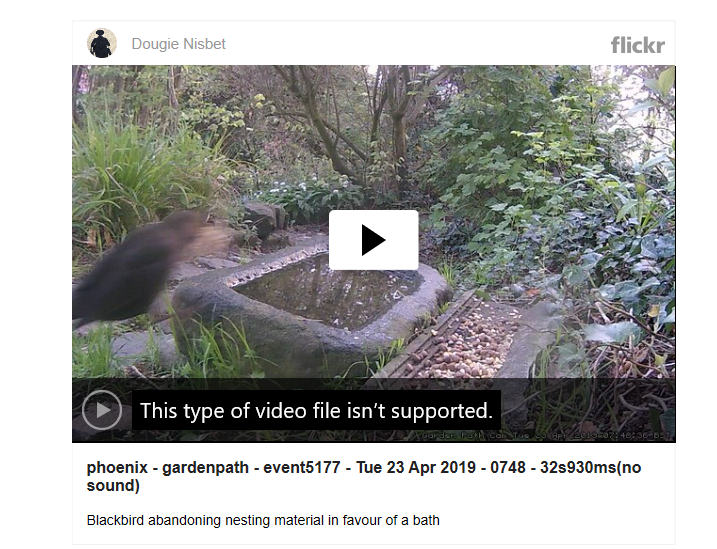 This also happens under Firefox (Windows 10), whereas Edge has a bold overlay that states: This type of video file isn’t supported. This is the same video file that I uploaded to both Flickr and Zenfolio, so presumably they are handled, stored or delivered in some subtly different way. Well this is interesting. Is there a difference between pre and post Smugmug Flickr? A lot of migration has been going on after SmugMug bought Flickr, and I wonder if it’s videos either side of that migration that are causing the fun. Here’s some iPhone footage taken on the River Wear in Feb 2018. It seems fine using the Flickr Embed option. Now here’s some iPhone footage, (same iPhone), taken recently and uploaded to Flickr. Using the same Flickr Embed option. Same Camera, same embeding technique. One works, the other doesn’t. The only difference is the time they were uploaded. Let’s try that test again. 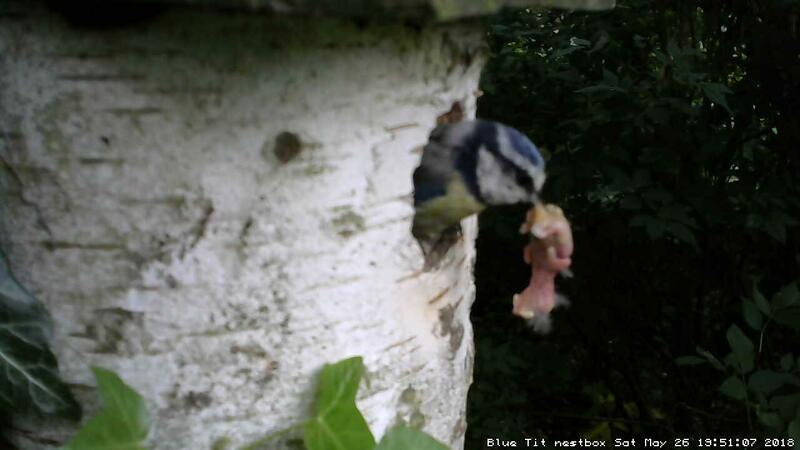 Here’s another clip from the garden path webcam from Jan 2019. And it works fine. Finally a couple of examples using the photonic plugin. Same story. It works for video uploaded before the migration, but not after. Time and Patience are not waiting for me and my experience of Flickr has always been exasperating. I had a legacy Pro account but with the acquisition by SmugMug the cost of that has jumped and I don’t think it’s worth the money. I’ll probably not renew my Flickr Pro subscription in May and stick with Zenfolio. Vimeo Plus was great for its video sharing but a bit of an overkill for people like me who just want to potter about with smartphones and webcams. But then, the money saved by not paying for Flickr. Hmmm ….